On his HBO show, Real Time, Bill Maher has a segment where he talks of what he knows to be true, despite not having any direct evidence. On 7 October 2016, I think it was, Maher showed photographs of a jack-o-lantern and Rudy Giuliani, side-by-side and said, “I don’t know for fact that jack-o-lanterns always have better teeth than Rudy Giuliani, I just know it’s true. Truth can hide in comedy. Maher, of course plays it for comedic effect. Still, there is a hint of reality in this desk piece. Old wives tales and stereotypes also contain a hint of truth. This makes me think of an episode of the old classic, the original Star Trek series. Captain Kirk is on trial, being court-martialed. Spock must testify. Spock starts dumping facts, ala the old show, Dragnet. Then, right in the middle of his testimony, he says that the computer record is wrong. The prosecution asks how he knows that. He replies he knows Captain Kirk; he knows how Kirk reacts in stressful situations. Even though he didn’t see what the captain did, he knows what he did. Spock puts it this way. If he drops a hammer on a planet with positive gravity, he doesn’t have to see it fall to know that it fell to the surface. It did. 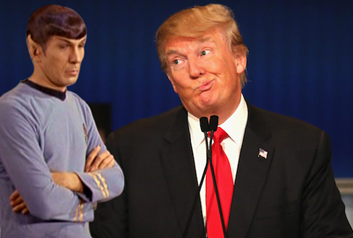 Using the Spock argument, it’s clear to me that Donald Trump is a criminal. It comes down to this. Robert Mueller is in the midst of an investigation. Trump and his minions spend a great deal of time maligning the investigation, calling into question the loyalty of everyone conducting in it and saying that it’s a witch-hunt. How many times has he said that it’s fake. How many times has said there’s no point to it, no need for it and so on? So, why does he do that? Let’s remember, Mueller is responsible for conducting a special investigation to determine if the 2016 election was hacked by the Russians. The Mueller Mandate includes nothing of Trump or his actions, not a word. Okay, sure, calling into question the election means questioning the legitimacy of his election, but that doesn’t mean he was at fault, he was involved or he committed a crime. President Trump certainly fears further evidence of the illegitimacy of his election win, which may or may not exist. He may have shady deals with Russian banks or oligarchs, which he is scared to reveal. Then, of course, there’s the possible tax dodges, money laundry and gawd only knows what he does behind closed doors with Putin, for two hours. As that hammer dropping, only one conclusion is possible. Trump is hiding something and it must be some illegal acts. So, we have to wonder, what is going to happen in the future? Mueller will release his report, which will list all of the crimes of Trump and his associates. Then the speeches, denials and attacks on the investigators begin. Various parties will file court, accompanied by frantic demands that it isn’t worthy of a court hearing. Trump will deny everything, blame everyone else and demand the Republicans and his minions support him. That’s when the fireworks will truly go off, as this will be the true test of loyalty of those people. Will they follow Trump off the cliff, metaphorically? Will they turn coast and become true patriots? Here’s the major point of this sorry episode. I don’t know what they’ll do. There was a time when I felt the majority of Americans truly loved this nation and would stand by it no matter what, the old country first devotion. These days, I can’t say that’s the case with some people and that’s scary. The Watergate scandal was a difficult time in our nation. We got through it because enough good people stood up to the bad. Is lunacy now the norm? Today, with this administration, with this level of corruption and cronyism, this degree of hypocrisy and outright Double Speak right out of 1984, I’m not sure where this will lead. To see Trump sometimes literally changes his line minute by minute; to see his followers act as if his insanity makes sense is likewise out of that terrifying book, 1984. Never did I think such lunacy would become the norm. Yes, we live in scary times, which so very sad.